Our country’s birthday is soon; our family is coming for a BBQ & I have a long list of preparations. I have a guest list & a menu to check, bedrooms to freshen up & flower beds that need attention. I surround myself with rulers, markers & glue and I remember the days I prepared displays for my classroom as I get ready for Independence Day. I want them to catch the eye of the family and temporally distract them from hot dogs and watermelon slices. Each year I set up new & the old display boards. I like to see nieces & nephews & cousins examining the boards and using a finger to trace the lines of their particular branch of the family. Do you have a yearly family gathering? Do you have a format for sharing your genealogy findings? Add a comment & share your ideas. Travel Tuesday: Where Have You Traveled? My family will be gathering! Independence Day means it is time for the family to gather here for a big cookout. There will be aunts & uncles and cousins of all ages. It is a great time to reconnect and a great time for me to share my research into our family history. I set up trifold displays highlighting my research. One year I showed everyone how our Brown family moved from Virginia, through the Carolinas, into Louisiana & Mississippi. Our branch continued into Ohio and the New York. I included information on the routes they may have taken & details about The Federal Road. The display inspired lots of conversations about our family. What about our current family & travel? When the family gathers it is also time for fun. This year I have a couple contests. 1. How many states have you visited? Has anyone visited all 50? Who has visited the most states? 2. What is the most unusual place you have visited in the USA? Was it an unusual museum? The largest ball of string? Judges will select the winners. Everyone will add post it notes to a trifold display. It should spark conversations about our family's current travels and maybe some interesting stories to add to our family's history. I have sewn fabric baskets in red, white & blue. They will be filed with small surprises & given to the winners. How will you celebrate the 4th? My great aunt Marion (Coyle) McCall Kunemund lived in New York City for most of her life. When we visited her there in the 1950s & 1960s we saw her writing desk, her secretary. In the 1970s she moved to Florida and the writing desk came to our house. My mother had always admired the desk and she loved having it in a place of honor in our living room. My mother kept her writing papers and photographs inside. The desk now has a place in my bedroom. The dark wood matches our bedroom furniture nicely. I keep a collection of framed family photos on the shelves and greeting cards in the drawers. I am very happy to have my turn with this family treasure. Social Security Application = Birth Place! I found a new piece of information about my great grandfather, Jasper Pascal Brown. I have census records, his marriage record & death record. I have family stories. I have found him in published genealogies. Each of those sources told me Jasper was born in Mississippi! Now I know where, in Mississippi, he was born. An Ancestry search showed me Jasper’s Social Security Application. Because Jasper was born in 1865 I did not think of him as having a Social Security number. This application, for which I believe he must have supplied the information himself, gives his birth place as Gillsburg, Mississippi! 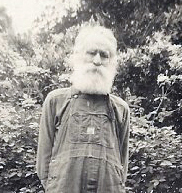 US census reports showed his parents in Amite Co., MS in 1850 & 1860 and in Pike Co., MS in 1870 & 1880. Jasper was born between those reports. Which county was he born in? Gillsburg is in Amite County. This is just one more reminder to never overlook a resource!